When I started The Wager I wasn't sure if I would be able to fall in love with Jake Titus, if you've read The Bet then you know all about his selfish womanizing ways. Let's just say he had a lot of work to do to redeem himself in my eyes, but believe it or not he actually did! In The Wager you get to watch first hand as Jake slowly transforms from his cocky womanizing ways and falls in love with a former fling and childhood friend, Char. She is someone he has always been attracted to but never felt worthy of. On the other hand Char has been in love with Jake for as long as she can remember, but every time she allows herself to get close to him he ALWAYS disappoints her. Their last encounter has left her with an even bigger chip on her shoulder and now the two are expected to work together as they help Kacey and Travis with the final wedding arrangements. As the saying goes its a fine line between love and hate, these two have some serious chemistry and when it explodes its hot! She is the maid of honor and he is the best man, its the perfect scenario and in the end we are rewarded with an absolutely heartwarming, funny romantic comedy with a good dose of steam. Grandma Nadine feels responsible for Jake's current reputation, believing everything was handed to him too easily and it's her intention to bring him down a few notches. Watching her "ruin" him was some of the funniest parts of this book. Grandma may be a secondary character, but I swear she steals the show on more than one occasion. This woman is an absolute hoot! She is loving, wise, manipulative, confident, outrageous and the list could go on. I think everyone needs a Grandma Nadine in their lives. What an awesome character, purely genius to create her Rachel Van Dyken! The story is told mainly from the perspective of Jake and Char however we are also treated to the perspectives of Travis and Kacey. What you get is a well rounded story that fits together seamlessly. There is also the added bonus of still seeing Travis and Kacey very much in love. It's as if you are actually getting to witness their wedding first hand. 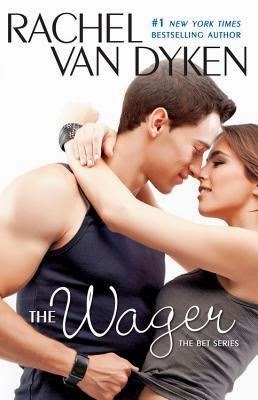 The Wager was such a fun enjoyable read. It was a lighthearted story that filled my heart and hooked me from the first chapter. This book had me laughing, so hard sometimes my eyes were watering. Yet there were also some very sweet, sentimental moments which pulled my heartstrings and brought actual tears to my eyes. I cannot express enough how much I truly LOVED this feel good romantic comedy! And for $2.99 its a total bargain, I'm serious go ahead and buy this book, it won't disappoint.